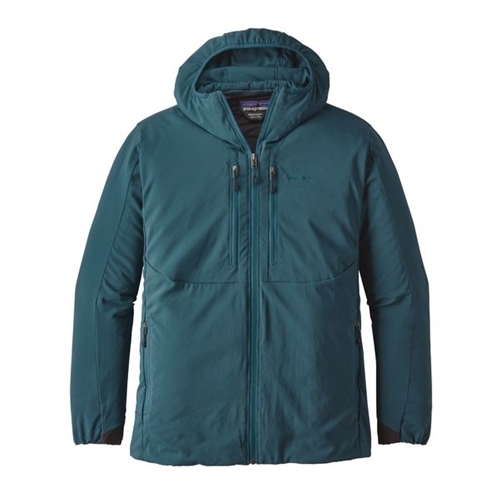 The highly packable Patagonia Men's Tough Puff Hoody is highly water and abrasion resistant. This hoody is lined with stretch capilene and has the right amount of breathability. This Hoody would make a great hunting piece as it is very quiet and highly packable. This hoody offers two front chest pockets to stash fly boxes or whatever best suits your needs. The Patagonia Tough Puff Hoody is like a more robust brother to the Nano-Air Hoody as it offers full range (Nano air) insulation, has a regular fit and a softshell face fabric (durability, wind block, water repellency). Here’s the dilemma: It’s not quite rainy enough for a hard shell, but you don’t want to thrash your puffy busting brush on the way to the water. Combining warmth, durability and freedom of movement, our new, fish-specific Tough Puff Hoody solves the problem with a stretchy and abrasion-resistant face fabric that moves with you and, thanks to a DWR (durable water repellent) coating, shakes off moisture or passing showers. Inside, the Tough Puff keeps you warm with the same ultralight, 60-g FullRange® polyester stretch insulation we use in our Nano-Air® designs. Two large, vertical fly-box pockets on the front, two zip-closure handwarmer pockets, and a moisture-wicking, 100% recycled polyester Capilene® body lining round out the technical package for ultimate comfort on the water. 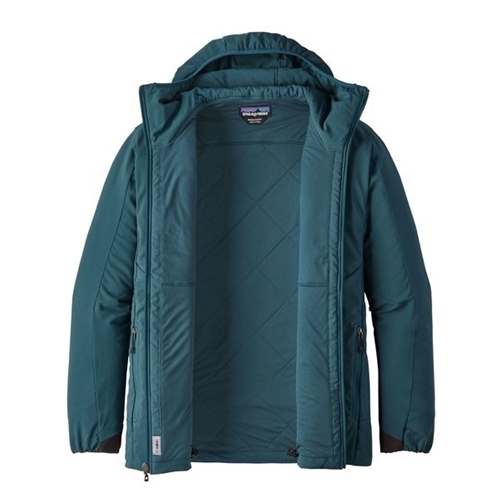 I have owned many Patagonia items and all have been very long lasting (more than 20 years on most) and I expect this Tough Puff will do the same. Wearing it now in Alberta with temps in the teens or lower and, with a fleece sweater jacket as a layer under the Puff--I stay warm. Also impressed with the materials used for this jacket--a nice stretch material that is also soft. Patagonia never fails me! I am 5'11" and 193 Lbs. I got the large to accommodate layering, but it is a good without all the layers too.